"I just look forward to coming to work; I don’t have that Monday morning feeling. I enjoy it here and I’d recommend anybody who gets the chance to become an apprentice to take it." 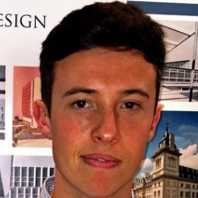 Dean landed an Architectural Technician Trainee job, an apprentice role, and has also transferred to Derby College’s Professional Construction and the Built Environment Level 3 Extended Diploma. His long-term is aims to go on take Royal Institute of British Architects (RIBA) qualifications. Find out about studying Plumbing at Derby College.